It’s a shame that many people find pumpkin so difficult to deal with. I love pumpkin. I’m so glad they are now in season as they are one of my great Autumn pleasures. While the stereotypical Halloween pumpkin only seems to stick around for a short while (no doubt all stocks are depleted over the Halloween period), there are still a variety of squash’s and gourds that make a more prolonged appearance. 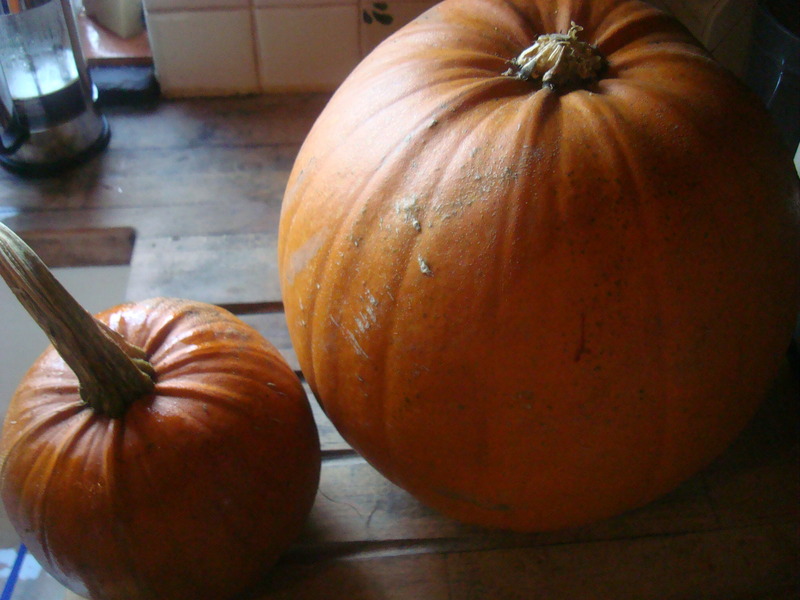 When it comes to eating seasonally Pumpkin is what should be taking pride of place on our table. Not only do they look beautiful, they taste fantastic and because they are really a fruit they are totally versatile. Use them in a creamy comforting soup, roasted with some wintry herbs (like thyme and garlic or rosemary) or add some zingy spices; chilli, lemongrass or ginger gives an exotic edge as does a sprinkle of Zahar or Sumac or add sugar and spice and it turns into the filling for an all American pumpkin pie. I’ve blogged about my pumpkin soup with chilli and ginger before and true to form I will be making it again this year, but I’m at risk of being predictable so I thought this year I’d also try something different, pumpkin and ginger jam. I know, it sounds weird, a bit like the tomato chilli jam I’ve made recently, but I found a basic recipe in one of Hugh Fearnley Whittingstalls columns, added a couple of touches of my own and voila! Pumpkin to last through the winter, to serve with Christmas meats or cheese or even on my toast. Now I just need to see if the kids will eat it! Mix all the ingredients in a big saucepan and leave over night to macerate. I used 600g of sugar, but the original recipe used 900g so if it seems like it needs more sugar add another 100g. I don’t think the 900g is necessary. 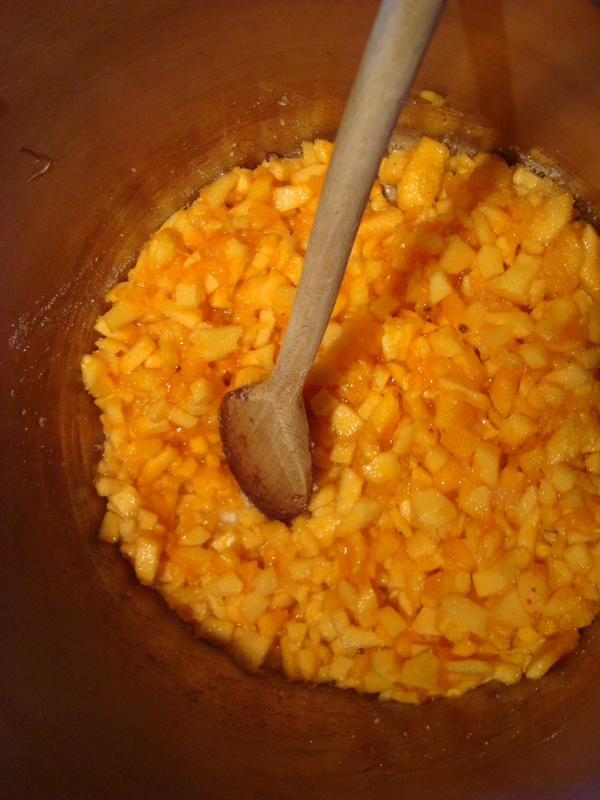 The next day, bring the mixture slowly to the boil stirring until the sugar has dissolved. Boil rapidly for about 20 to 30 minutes or until it has reached a setting point. Test for a set by placing a saucer in the freezer until very cold. Then drop half a teaspoon of the jam on to it and see if a skin forms. If it does your jam is ready. Leave to cool and then pour into sterilised jam jars. 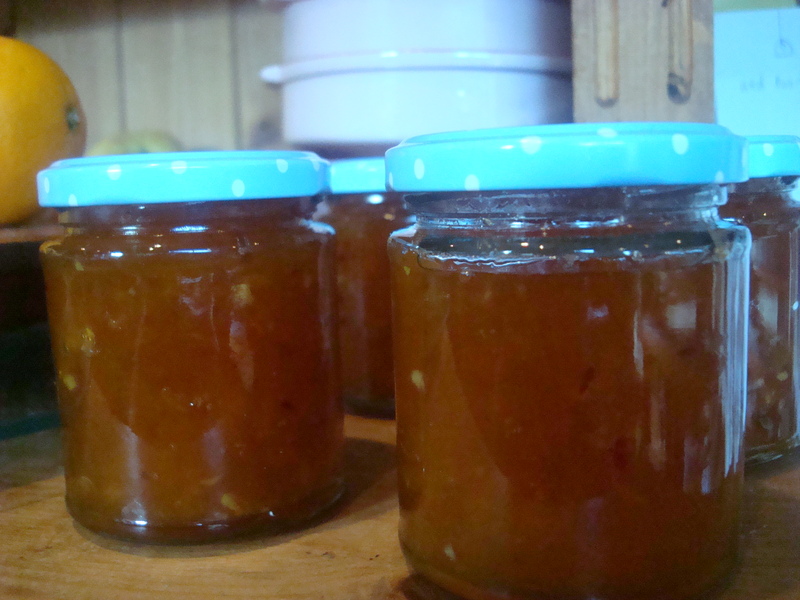 The recipe only made four small jars, but the gorgeous jewelled orange colour and sweet but sharp taste reminded me of marmalade….our own British version!